WSP is proud to support and strengthen the Indigenous communities we are privileged to work with. We responsibly deliver a wide variety of projects, while fostering opportunities for training, involvement and local initiatives that create a future for Indigenous youth. 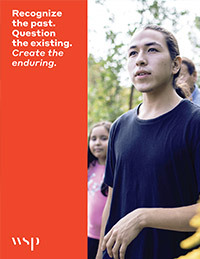 Every Indigenous community is unique – with different experience, history, social customs, traditions, governance and social circumstances. What they share is an interest in making decisions that bring sustainable benefits, both now and in the future. 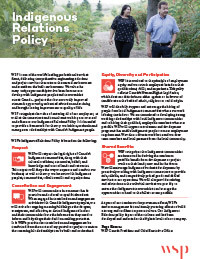 WSP recognizes that success depends on building long-term partnerships and reinforcing a culture of sharing alongside Indigenous people – Inuit, Métis and First Nations. As a company with deep roots coast-to-coast, we understand the challenges these communities face and recognize the need for frequent, open and honest communication. With over 8,000+ readily available and qualified field resources and office support staff across Canada, including specialists such as anthropologists, archaeologists, sociologists, socioeconomists, geographers, surveyors, GIS experts, community planners, and engineers from multiple disciplines, we have the knowledge and experience where and when you need it. We form strategic partnerships with local Indigenous experts to enhance our capabilities on projects and to understand the needs, expectations, concerns and beliefs of these communities. WSP has also cultivated multiple joint venture agreements and key community partnerships throughout Canada to maximize the benefits to the local community through training and employment of qualified band members and the participation of Indigenous businesses.